Some companies will give you two options when it comes to repairing or replacing your fascias and soffits. You can go for the Full Replacement or the Cap Over. We would never recommend or complete a job using the Cap Over method as we would be doing you a disservice if we recommended it and we would not be able to guarantee it. Why Is Capping Over Old Fascias Not The Best Option? Why Choose UPVC Fascia And Soffits Instead Of Wood? Roof Ventilation Why Do We Need It? Why Inspect And Replace The Eaves Felt? On a price comparison basis then having capping boards fitted over your existing timber fascias rather than having all of the old timber removed and replaced with new uPVC fascias does seem the more cost-effective option, but it is not really such a good idea. Usually when you are replacing Fascias and Soffits it because you have noticed that they have become rotten, or you have had water getting into your roof space. Well if you simply cap over the rotten wood, you haven’t solved the problem you have simply hid it. The old wood is still there and each year it will deteriorate even more. 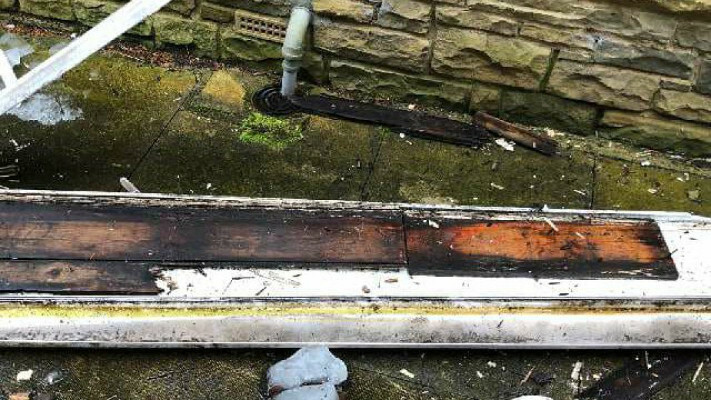 Eventually, as the wood becomes fully rotted and infested the nails holding your new fascias in place will come loose and leave your fascia boards exposed and unsecured and allowing woodworm and other vermin access to your roofline, which if left untreated could end up causing structural damage to your home. Costing you more in the long run. So capping over your old fascia boards is a false economy really, which is why we never recommend it to our customers. Wood fascia and soffit boards require regular maintenance to keep them not only looking good but to also stop them from rotting, once water has gotten into the wood then it will have to be replaced before it fully rots. Freefoam uPVC rooflines are maintenance free as they will not rot, don’t discolour and you will never have to paint them All you will have to do is to give them an occasional clean with warm soapy water. If you do not have adequate air circulating in your roof space then you can get a build up of condensation which eventually will cause damp and mould and lead to rotten timbers in your roof. Adequate roof ventilation systems ensure a good supply of air prolonging the life of your roof timbers. To protect your roof from moisture retention and the problems it can bring you can choose between either soffit air vents or the discreet over uPVC fascia ventilation systems. The reason your timber fascias are starting to rot is usually due to water ingress. The water normally gets in through broken tiles, cracked verges or damaged felt. The area most prone to damage is the exposed strip of eaves felt. Often your fascia exterior will look intact, but behind the scenes, there is a lot of deterioration going on. As part of our Fascia and Soffits installation procedure, we will inspect and replace your eaves felt. Without any protection gutters can become blocked with leaves, twigs, moss and birds nests, this will prevent the rainwater flow to the downpipe. By installing a Gutter Guard you will keep your gutters free from all of that debris. If you have vented Soffit boards then you might want to have an insect guard installed for added protection against infestation by unwanted vermin in your roof space.